Formal analysis of security protocols is largely based on a set of assumptions commonly referred to as the Dolev-Yao model. Two formalisms that state the basic assumptions of this model are related here: strand spaces [FHG98] and multiset rewriting with existential quantification [CDL+ 99,DLMS99]. Strand spaces provide a simple and economical approach to state-based analysis of completed protocol runs by emphasizing causal interactions among protocol participants. The multiset rewriting formalism provides a very precise way of specifying finite-length protocols, with a bounded initialization phase but allowing unboundedly many instances of each protocol role, such as client, server, initiator, or responder. Although it is fairly intuitive that these two languages should be equivalent in some way, a number of modifications to each system are required to obtain a meaningful equivalence. We extend the strand formalism with a way of incrementally growing bundles in order to emulate an execution of a protocol with parametric strands. We omit the initialization part of the multiset rewriting setting, which formalizes the choice of initial data, such as shared public or private keys, and which has no counterpart in the strand space setting. The correspondence between the modified formalisms directly relates the intruder theory from the multiset rewriting formalism to the penetrator strands. The relationship we illustrate here between multiset rewriting specifications and strand spaces thus suggests refinements to both frameworks, and deepens our understanding of the Dolev-Yao model. 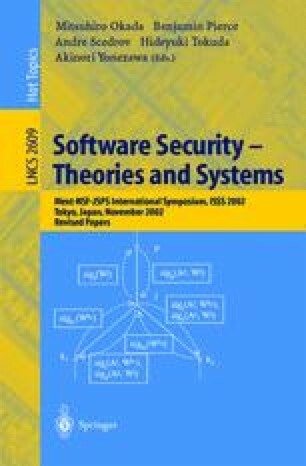 Partial support for various authors by OSD/ONR CIP/SW URI “Software Quality and Infrastructure Protection for Diffuse Computing” through ONR Grant N00014-01-1-0795, by NRL under contract N00173-00-C-2086, by DoD MURI “Semantic Consistency in Information Exchange” as ONR grant N00014-97-1-0505 and by NSF grants CCR-9509931, CCR-9629754, CCR-9800785, CCR-0098096, and INT98-15731. This paper is a revised version of [CDL+00]. Nancy Durgin, Patrick Lincoln, John Mitchell, and Andre Scedrov. Undecidability of bounded security protocols. In N. Heintze and E. Clarke, editors, Proceedings of the Workshop on Formal Methods and Security Protocols-FMSP, Trento, Italy, July 1999. Extended version at ftp://ftp.cis.upenn.edu/pub/papers/scedrov/msr-long.ps.